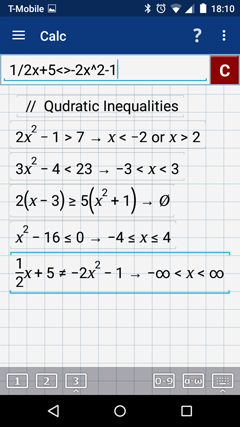 Solving a quadratic inequality means finding values for x​ that make the inequality true. Type the inequality as given in the problem with one inequality per line. 1) Enter the expression: 2x^2 - 1 > 7. 2) Enter the expression: 3x^2 - 4 < 23. 3) Enter the expression: 2(x - 3) > 5(x^2 + 1) as "2(x - 3) >= 5(x^2 + 1)"
Type the greater than or equal to sign ( > ) by first typing the greater than sign and then the equals sign " >= ". 4) Enter the expression: x^2 - 16 < 0 as "x^2 - 16 <= 0." Type the less than or equal to sign ( < ) by first typing the less than sign and then the equals sign " <= ". 5) Enter the expression: 1/2x + 5 ≠ -2x^2 - 1 as "1/2x + 5 <> -2x^2." Type the inequality sign by first typing the less than sign " < " and then the greater than sign " > " to get "< >".